Among the first issues I encountered when working on a windows phone application was the simple, plain textbox. This apparently friendly control has a dark side in a particular use case. When the InputScope is set to Numerical, it allows entering multiple decimal points. In my case, I didn’t needed this “feature”. The best solution I could find to limit the decimal point to one, or none, was to develop an attached behavior. You can find the complete solution here. The attached property IsDecimalPointAllowed will set the behavior to allow one or zero decimal points in the input. When the attached property is set to true or false, the value of the regex is established. 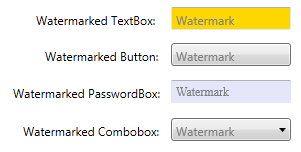 There are a lot of scenarios where you have to apply a watermark on a WPF control. Since there is no such functionality on the standard WPF controls, the WPF Control Toolkit provides an extended text box that meets the requirements. This was hardly sufficient in my case and of course, I thought I can do better. I developed an attached behavior instead, since I wanted to apply the watermark on multiple types of control. Also, I intended to keep some elements of the original background in sight, so a lot of the code written is focused in that direction. You can download the complete solution from here. Let’s have a look of the implementation. Property for defining the property of the control that is checked before applying the watermark. If this property is not set, a couple of predefined properties are checked. 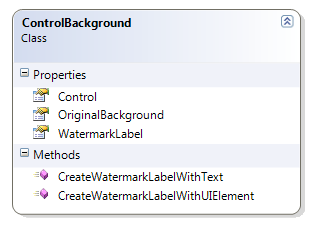 This class contains the property WatermarkLabel, which will be used when applying the watermark in the behavior class. Also, the class stores the original background of the control. This way, when the watermark is no longer needed, the control’s background can return to it’s original state. The behavior class holds a list of ControlBackgrounds. Every time a control is loaded, the original background is stored in a new record of this list that also holds the correspondent watermark. The watermark is created by changing the background of the control with a new VisualBrush that has the Visual of this label. For any improvements or issues of this solution, please feel free to comment.